Is it a bird? Is it a plane? ...well actually, it is! While this large cargo freighter (LCF) may resemble a plane about to give birth, its purpose is not far removed and it's taking air freight to a whole new level. Quickly view the latest exchange rates including AUD, NZD, USD, EUR, GBP and even Bitcoin. Numbering just four in the world, the Boeing 747 Dreamlifter is used exclusively to move entire sections of subassembly Boeing 787 planes, across the globe, for final construction at a central location within the United States. Its use supersedes the need for sea freight shipping, reducing and improving the length of time to transport parts for manufacturing and assembly. Completed in 2006, the Dreamlifter is an extensively modified 747-400, featuring a bulging fuselage which can hold three times the volume of its predecessor. A large hinge at the rear of the plane allows the tail to be swung open, facilitating cargo hold access. Unsurprisingly, it's unusual design has drawn comparisons to Howard Huges' H-4 Hercules (the "Spruce Goose"), and even an apology from the Boeing CEO to the 747 designer for "what we did to your plane". As the saying goes, "necessity is the master of invention", and we think it's a great example of logistical needs shaping design. 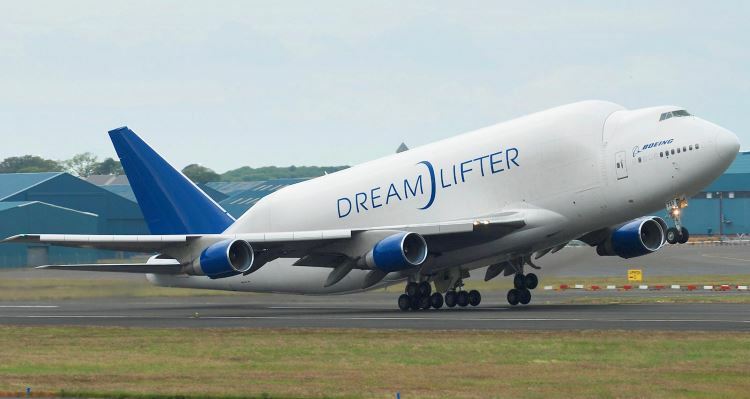 At a glance it's easy to think the Dreamlifter shouldn't fly, yet it does, and the final result is a perfect blend of functionality, ingenuity and courage to explore the seemingly impossible.